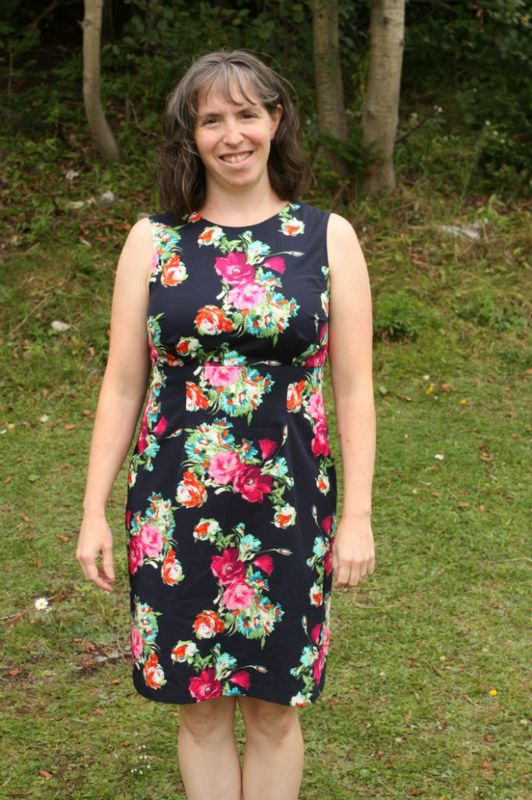 Devoted Quilter: I Made a Dress! I am so excited about this finish! 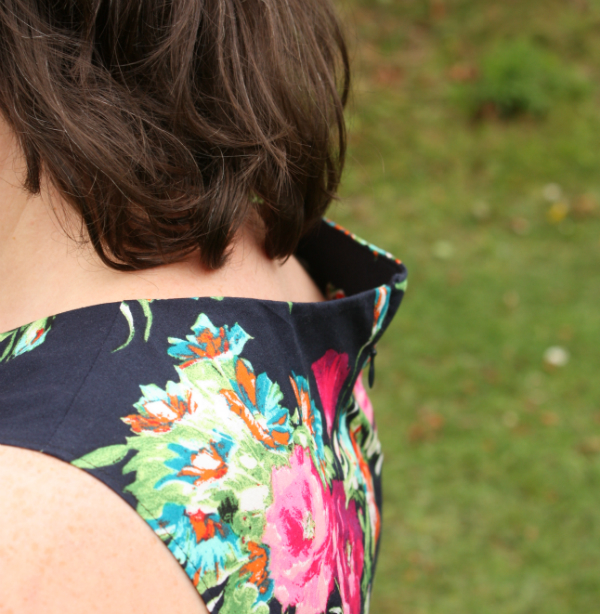 This is my Megan dress, from Love at First Stitch by Tilly Walnes. I learned so many new things with this pattern. First up, Tilly recommends using cotton poplin, among other options. I had never heard of poplin, so I had no idea what it would feel like, though I could find some pretty ones at L'Oiseau. While I was still debating whether or not to order a fabric I may not like to touch, someone on Instagram posted a picture of a new poplin she was about to cut into and I immediately commented on her picture and explained my dilemma. She responded with a nice description (if I remember correctly, she described it as being softer than quilting cotton but crisp enough to hold its shape), and I went ahead and ordered my fabric. I love the feel of it, and I'll certainly use it again for other projects. As a bonus, poplin doesn't need to be ironed. I folded (or balled) this dress up many times to put it aside while I was working on it and it doesn't wrinkle at all! Next came fitting. This was my first time ever making anything to wear on my top half, and it was an adventure! I'm so glad I started by making a version out of an old bedsheet to figure out the sizing. The first one I made was too big across the shoulders, but the front of the arm hole was pulling forwards. A little research online and I decided I needed to make a smaller size, but with a Full Bust Adjustment. Oh boy, that sounded complicated! Thankfully, it was simpler than I thought, and the second bedsheet version I made fit nicely, though getting the darts repositioned took a few tries. Once again, I was nervous cutting into the fabric, but it felt good to finally get started on the real dress. Thanks to the bedsheet testing, the dress came together pretty well. The invisible zipper only took one try, though I did make a mistake. The pattern says to put the zipper top at the neckline seam, but I misunderstood and put the top of the zipper tape at the neckline seam, which means the zipper itself starts lower than it should. I had sewn a few other steps before realizing my mistake, so I left it. A hook-and-eye closure works to keep the top closed. 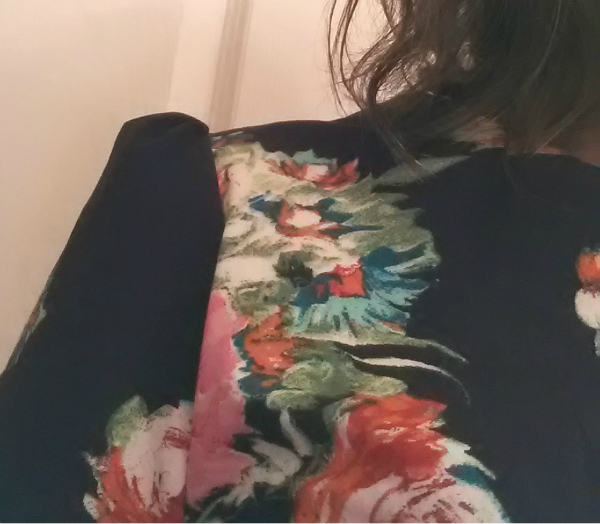 I do find the back of the dress gapes right at the neckline, though I don't know why. I'm hoping that when I see my seamstress sister-in-law this weekend she can give me some insight as to how I can fix this, or at least prevent it on my next version. Too bad my hair is just a little too short to hide the gaping! As I was working on the dress, I kept saying I really liked the sleeveless look, but I planned to make this one with the sleeves. That is, until I actually put the first sleeve in. I knew from the picture of the dress in the book that it had a puffy sleeve, and I wasn't really sure I would like that, but I figured I'd make it at least once. When I looked in the mirror, though, I felt like I was wearing a little girl's princess costume! It was waaaaaay too puffy for my taste. So, the next morning I went online again to figure out how to finish the arm holes, since I didn't have enough fabric to make bias binding. I found a tutorial for doing a baby hem, and that's what I went with. The dress is really comfy too, so I'm thinking I'll get lots of wear out of it. Add a cardigan and some tights and I'll be good to go for the fall and winter. And now that I've made a (somewhat imperfect) dress, I feel like I can learn to conquer any garment out there. The dress looks beautiful and so do you. The last time I sewed a dress was for the 2 brides maids for my daughter's wedding 18 years ago. I did the bed sheet pre fitting for the first and only time. It worked wonderfully. And for the first time ever, I sewed the hems on by machine. That would have made my 4-H leaders and home ec teachers rollover in heir graves. Funny how now that very hemming stitch is what I do so much of in hand applique only a lot tinier. Congratulations on your beautiful new dress. I need to get back to sewing clothes, too. Enjoy wearing yours this year! Oh my gosh, this looks so good on you! You did a wonderful job and I'm so impressed. I'm not sure why it gapes in the back, but I'm sure you'll be able to figure it out. I imagine it would be hard to do a fitting on yourself, but you did it so well. Great dress! It looks great. I've been wanting to try a dress pattern. You've given me the encouragement to give it a try. And what a lovely dress it is! Bravo! I've not been brave enough to try any garments yet. I found you on Let's Bee Social! Feel free to visit my spot anytime. Good job! Does it need neckline darts> I've never made anything without them unless from a knit. Ahh, that's probably exactly what it needs! Thank you! Congratulations on your gorgeous new dress, Leanne! You look fabulous in it! It was a pleasure to follow your progress on instagram and I like it without sleeves better too. Loved reading about all your experiences and thoughts on the process. Your dress turned out really beautiful! Well done!